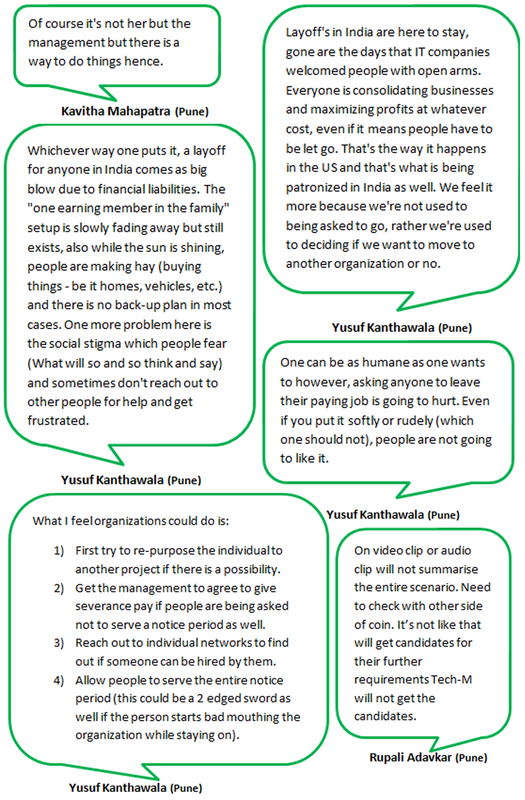 The Talent Acquisition profession is no stranger to the concept of Layoffs or the controversies surrounding it such as what is the humane way to conduct them? We’ve heard so much negativity about it but how many of us have really focussed on the positive aspects to realise the silver lining in such scenarios. There are always two sides to a story hence one needs to check about the other side as well before passing judgement. When conveying the message ensure you think from a Doctor’s perspective conveying the message to the patient suffering from Cancer. Nor Recruiters or Employers and neither Employees are innocent all need to do their part and work hard. You also need to consider the aspect that you don’t know what the next action plan of the employee might be. If the Management is imposing their decision of expecting the Employee to resign overnight and require the HR to follow through with it then deal with the situation with the utmost care. As far as possible the Management or Employer needs to avoid such scenarios from occurring hence the panning needs to be done in more efficient manner. As Recruiters, understand the consequences of your actions, words and the tone you use when conveying the message. As fellow Recruiters you also need to realise the reasons behind the Recruiters behaviour towards an Employee’s layoff. Know that sometimes it’s probably the Management who may have pressured the HR to do things that they normally wouldn’t do if they were in their right mind. In such a scenario it is essential for an HR to figure out the best way to convey the message in an appropriate manner irrespective of the Managements instruction as far as possible. When a company decides to layoff an employee they need to make appropriate provisions available if possible to help the candidate move on. When inappropriate behaviour is expressed by an HR the Employer should ensure that even their HR under goes NLP trainings for improvement. When you lay off Employees it helps when you offer them certain benefits like health if possible as this good gesture may reduce the casualties in the process. Exposing ones shot comings may minimize the organisations chances of capturing talent in future. Simply ruining an organisations reputation doesn’t mean they won’t get candidates for further requirements. All it does is it gives, the afflicted individual an outlet to get their frustrations out but in turn the person exposing the organisation’s short coming’s their reputation tends to get ruined. This leaves the afflicted person even more upset further as it reduces their chances to get hired in another organisation. Employers should ensure that their Employees under -go extreme intense Behavioural Training and Coaching post the inappropriate behaviour but if the Employee improves great else lay the person off. Most companies are consolidating businesses and maximizing profits at whatever cost, even if it means people have to be let go. With the ever increasing costs of IT professionals India is slowly losing its preferred outsourcing destination status. Using newer technologies and automation can help companies achieve their goals with minimum costs. You need to consider the employees perspective as well in your planning as you need to think about what if someone runs to the terrace to jump off, hence you also need to monitor the Employees you lay off. Handling a life altering situation is a tricky business & requires maturity beyond expectations, which is lacking among today’s professionals. Resorting to downsizing leaves very less scope for empathy, compassion and the humane approach we’re talking so much about. Engagements can help to set the Employee expectations right & prepare them for future challenges, changes & disruptions. The process should be ascertained in such a way that an employee can be recalled for any future opportunities. In the event of reducing staff it is important to treat the employee the same way they were treated when they were first on boarded. The most important aspect is that they are also human and there is a high possibility that we may face a similar situation in future. You need to treat them with the same respect and trust as you would yourself unless you’re concerned that the employee will e-mail everyone in the company. Involve them in day to day activities don’t make them feel alien all of a sudden. Allow the employee to cancel the scheduled appointments if a client is showing up later the same day. Allow people to serve the entire notice period (this could be a 2 edged sword as well if the person starts bad mouthing the organization while staying on). Get the management to agree to give severance pay if people are being asked not to serve a notice period as well. Always try to have a face to face discussion rather than a conversation via call or e-mail informing them that their job has gone. Give all required support to the person being asked to go. Let them know that as and when an opportunity arises in the organization, they would be the 1st ones to be reconsidered. Laid off Candidates can be perfect replacements for vacant roles in mid-level and small companies as they can maintain the balance. It is important for candidates to realise that it’s because of their talent and hard work that a Company grows and not the other way around. Employees / professionals working in the private sector should not assume continued stability in their current engagement with an organization. They need to keep themselves abreast with new methods of work, learn new skills & unlearn as well. This will make people strive towards re-skilling themselves, improving their efficiency / effectiveness & remain relevant or seek out other options. To stay prepared it is absolutely essential for IT professionals to up-skill / multi – skill themselves to avoid being laid off. 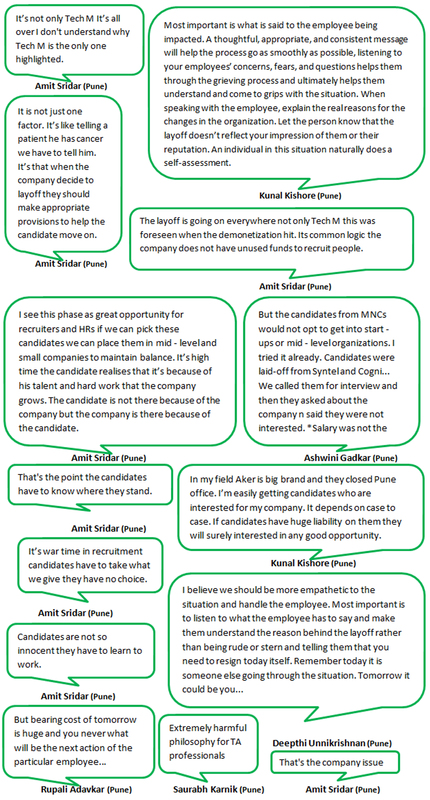 Candidates from MNCs generally would not opt for start-ups or mid – level organizations and the salary isn’t the constraint. At the same time Recruiters need to take care not to take undue advantage of the Candidates venerability and exploit it. Even though it’s a competition to capture the best Talent that doesn’t mean candidates have no choice in the matter. Candidates have no choice is one of the many misconceptions recruiters have; so you need to stay clear of such myths as they’ve always got a choice and so do you. It’s the Candidates life and they have a right to select either your opportunity or wait for a better one, no matter how dire the circumstances may be. As HRs we may ask for suggestions but the reality is that ultimately the decision to implement the suggestions rest’s in the decision makers we can hardly impose them. HR and Management should organize periodic engagements with all employees where they are given the right perspective on the overall scenario. Layoffs affect us so much because we’re not used to being asked to go, rather we’re used to deciding if we want to move to another organization or no. No matter which way you put it, a layoff for anyone especially in India comes as a big blow due to financial liabilities. While the sun is shining, people are making hay (buying things – be it homes, vehicles, etc.) without any back-up plan in most cases. Ideally the severance package is anywhere between 2-3 months full salary so it’s not the immediate financial impact but the loss of face among family & friends that matters. Given the amount of insights shared we think it is safe to say that we’ve covered almost all the possible aspects that needed to be addressed. Having said that, we’re sure you’d like to know more about the Best Employee Engagement practices as well. WhatsApp Group Chat – What will be the Future of HR? The HR profession has always been around and is constantly evolving. With the arrival of Artificial Intelligence automation is the next logical step. Having said that, it’s only obvious for one to wonder whether the future of HR looks promising? To find out which one applies you’ll have to decide after going through what has been mentioned. Machines won’t replace humans especially since its human resources. We’ve already seen a lot of atomised tools replacing traditional ways of working within HR but it will take time. The emotional quotient is the differentiating factor between other Management people and the HR. Companies without an HR advisor or HRBP will fail to accommodate their employee grievances, engagement, retention, trainings. Without the human touch or human factor entire manpower talent system will helpless! Most people believe digitalisation automation in HR field will replace humans. It easy to understand the analysis and data where earlier employees needed to be trained on it. Repetitive tasks like maintaining attendance records, etc. Human touch is required in HR so automation will not affect the core aspects of HR i.e. relationship building. The role of a ‘business partner’ cannot be automated, as employees need to be actively engaged in the company hence human touch is essential. Even if most tasks are automated there is a high chance that the HR will be the ones managing the automated tasks. Skill sets will play a major role in jobs. As all of us i.e. Clients, HR, Employees, Vendors are human beings a machine or an algorithm can never have Empathy. Automation/Digitization of HR has shifted HR functions right from HR Head to CHRO to CEO. HR has taken a front seat today in core Business Decisions, fetching the actual meaning of HR Business Partners & splitting the role HR Employee Partners from HRBP’s. Shifts in Recruitment function such as Manual Hiring to Job Portals to Social Media to Internet Mining etc. & from Newspaper Marketing to Digital Marketing. This all has been possible due to Automation as HR has been able to retrieve lot of Statistics, Insights, bringing Transparencies in the overall system. Companies have realized the fact & have shifted their focus from just being Customer Centric to Employee Centric as well. In HR handling the accountabilities with less expectation on CTC, so there is a high possibility that women might dominate in the future. The definition of Business Partner might change further but the roles will still be to bring more “Return on Investments”. The meagre skilled candidates get a job and survive with on the job learning. With the use of hand – picking mode making it extremely difficult for candidates to get a job with mere 4 years of engineering attendance. Employee engagement means engaging employees to the core, not just particular celebration days and outings. The concept of fun and related activities might disappear as the average age of the work-force might be in the mid-thirties. The attrition might be reduced as a result the organizations focus might drastically shift away from Engagement to Competence Improvement i.e. to be future ready. The Storm of next GEN will be coming where individuals will be more equipped with latest skill sets and will be advanced technologically. The Current workforce who realise that will also notice the sheen of the industry gone. The HR workforce will not wait for the organizations to invest on their learning curves as they would lose out on the opportunities available. Individuals will start spending to increase their skill levels to be competitive in the Job market. There is a high possibility that the transfer of ownership will be completely shift from the HR to Business. The organizations will make way for a broader and transparent appraisal system. All the new technologies will be highly integrated in letting the HR professional see the trends and insights. These trends are really crucial for HR to be able to make decisions and manage human capital. Organisations with the right type of talent and that know how to make the most of HR technologies are bound to succeed. 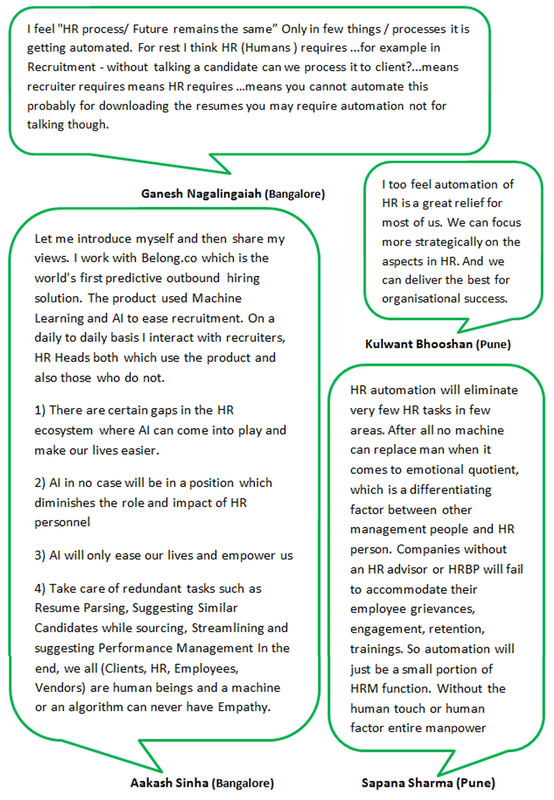 Automation of HR tasks is a relief for most Recruiters as they get to focus more on the strategic aspects of HR thus delivering their best for the organisational success. The focus should be more on strategic HR than transactional. HR as a whole has always been cost-centres which need to move into profit centres and adapt to these changes quickly. We leave you with some insights that can make all the difference to your approach in a career choice. It is a known fact that technology cannot replace the human element in the HR profession. According to Jack Ma “Machine intelligence is by the brain […] and you can always make a machine learn the knowledge but it is difficult for machines to have a human heart.” Therefore HRs can be rest assured that they need not worry about automation when it comes to maintaining human relations as these slots will always remain open if unoccupied. Chances are they’ll stand a better competitive advantage to getting hired provided they have the knowledge that their competitors lack. b) DM Us to @Sourcingadda with your name, location and Contact nos. More flexibility is given to employees due to the change in the mind sets with more control over their time. 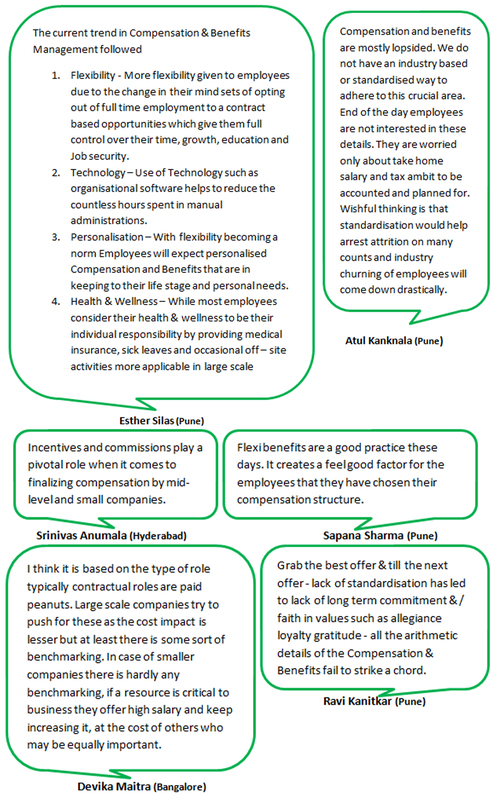 Flexible benefits are a good practice these days as it creates a feel good factor for employees since they had chosen their compensation structure. Use of Technology like organisational software helps to reduce the countless hours spent in manual administrations. With flexibility becoming a norm Employees will expect personalised Compensation and Benefits that are in keeping to their life stage and personal needs.